WHHHYYYYYY have I waited so long to read this series?!?!?! I am OBSESSED! Sarah J. Maas created the most magical and fantastical world! I was completley sucked in! Tamlin, Tamlin Tamlin. I love him. Like, seriously. LOVE. HIM. I just….I WAS NOT EXPECTING TO FALL FOR HIM. AND I DID. I FELL HARD. IT HURT. He was so romantic and dreamy! HE TOOK FEYRE TO A POOL OF STARLIGHT, OKAY?! How can you NOT fall in love with that?! Omg towards the end I was FREAKING OUT with worry for him!!! I couldn’t read fast enough!! Tamlin deserves love and happiness. He is so precious and perfect. I love him. I love him, I love him, I love him. Now. Unless you’ve been hiding under a rock, you’ve heard/seen the name Rhysand. And you know his name is usually followed by excessive fangirling. My first reaction to meeting Rhysand: OMG WHO IS THIS DELICIOUS MAN OF DARKNESS? My second reaction to meeting Rhysand: OMFG, HE’S EVIL!!! I was so intrigued by him and YEAH I WAS FREAKING OUT. I JUST WANTED TO KNOW WHAT HIS DEAL WAS. AND THAT ‘LOOK’ HE GAVE FEYRE AT THE END?! I NEED ANSWERS!!! I was dying to see the Night Court for basically the who novel AND THEN I FIND OUT THAT OUR DEAREST RHYSAND IS HIGH LORD OF THE NIGHT COURT?! WHAT. I didn’t IMMEDIATLEY fall in love with Rhysand (yes I did) but I do love him so much. I NEED MORE OF HIM. NOW NOW NOW. FEYRE IS A BOSS. All of the Under the Mountain scenes were epic. Ms Maas is quite the story teller. My heart was racing! Prythian is such a beautiful world and you will be swept away by it’s enchantments! This book was so exciting and I think book two is going to bring some DRAMA. Rhysand made sure of that *wink wink* I am ready. Let’s get messy, let’s get sickening, LET’S GO TO THE NIGHT COURT!!!!! 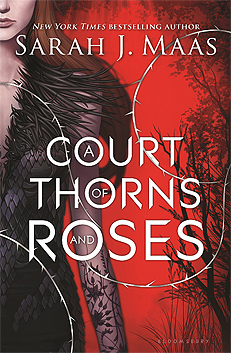 Sarah J. Maas is the #1 New York Times bestselling author of the Throne of Glass series and A Court of Thorns and Roses series, as well as a USA Today and international bestselling author. Sarah wrote the first incarnation of the Throne of Glass series when she was just sixteen, and it has now sold in thirty-five languages. A New York native, Sarah currently lives in Pennsylvania with her husband and dog. Empire of Storms, the fifth Throne of Glass novel,is available now.